Mazda is one of Japan’s smallest automakers, but they come up big with products that are compelling for consumers. The 2017 Mazda3 is one of those vehicles that comes in sedan and hatchback body styles. They offer good looks and superior driving dynamics in the highly-competitive compact segment. 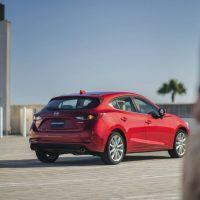 The Mazda3 will give rivals like the Volkswagen Golf, Honda Civic, and Ford Focus a good run for the money. This week, we drove the 2017 Mazda3 Grand Touring trim level. It gets a number of improvements that should make it even more competitive against its rivals. 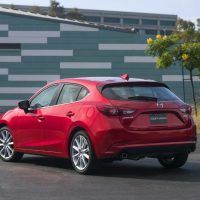 The Mazda3’s exterior styling has been freshened for 2017, with it getting a new nose and hatchback tail. The interior also gets a few upgrades and much needed sound insulation. 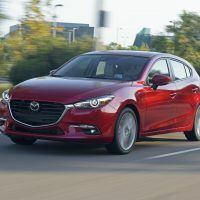 Under the hood, the 2017 Mazda3 gets a new engine management system called G-Vectoring Control that modulates torque to the front wheels based on steering input. This reduces body roll and improves directional stability. 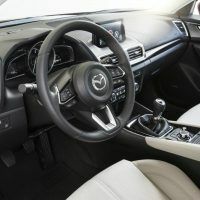 The 2017 Mazda3 Grand Touring Sedan ($23,145) comes standard with 18-inch alloy wheels, keyless ignition and entry, low-speed forward collision warning and mitigation, dual-zone automatic climate control, a six-way power driver’s seat, heated front seats, and a leather-wrapped steering wheel and shift knob. 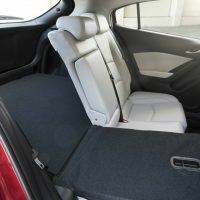 Our Grand Touring tester also came with a rear lip spoiler, sunroof, an auto-dimming rearview mirror, CD player, satellite radio, and a premium nine-speaker Bose surround-sound audio system. 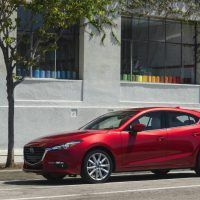 The Grand Touring gets the more powerful 2.5-liter engine, LED fog lights, a gloss-black grille insert, a digital speedometer, a heads-up display, and full leather upholstery. A Premium Equipment package ($1,600) added adaptive LED headlights, daytime running lights, LED taillights, a heated steering wheel, paddle shifters, an auto-dimming rearview mirror, and navigation. 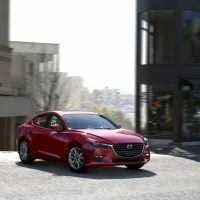 Also optional for this Grand Touring was the i-Activsense Safety Package ($1,100), which adds a more capable forward collision warning and mitigation system, lane departure warning and intervention, automatic high-beam headlight control, and adaptive cruise control. Total MSRP including destination: $26,880. The 2017 Mazda3 Grand Touring nicely reveals an attractive black and white color scheme with lots of padded surfaces and soft-touch materials. The controls are easy to find and we appreciated the heated steering wheel settings up front and next to the heated seats switch. Many automakers stick it under the dash, on the left side, where you have to hunt to find it. We also liked that the heated front seats don’t get so hot that it burns you. There’s three levels of heat and it’s easy to find the perfect heat range. The front seats are among the best in the class, offering plenty of support. They are extra comfortable for taking long trips and they won’t leave you tired after a rush hour commute. 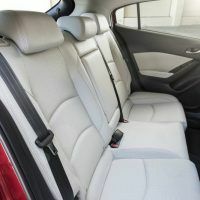 The perforated leather in the Grand Touring model is near luxury level. Another plus is the electronic parking brake. It saves room and makes for more storage space in the center console. In the back, there’s a surprising amount of legroom and headroom for average size adults. The seats split 60/40 and fold down for extra cargo carrying ability. There’s a handy fold down arm rest in the center and it holds two drink cups for rear passengers. 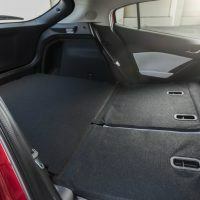 The sedan offers 12.4 cubic feet of cargo space in its trunk. 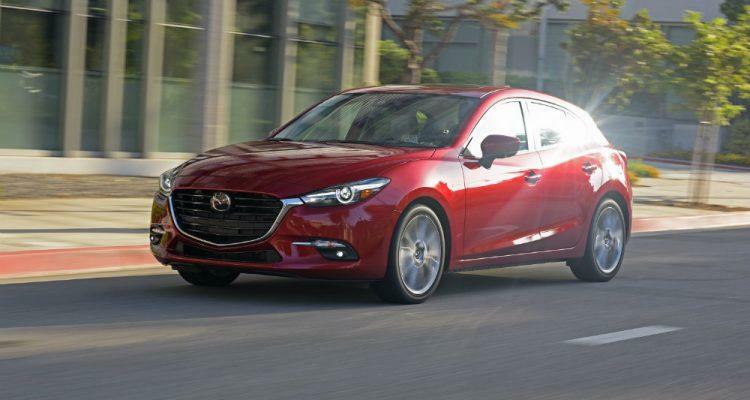 The Mazda3 Grand Touring gets the more powerful 2.5-liter engine, producing 184 horsepower and 185 lb-ft. of torque. It comes coupled to either a 6-speed automatic or the 6-speed manual transmission our tester came with. The EPA estimated fuel mileage is 25/34 city/highway and 29 combined using regular unleaded. 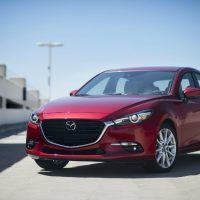 There were two thing we noticed right away as we got behind the wheel of the Mazda3. The cockpit is very driver-focused, with all the controls on the instrument panel arranged symmetrically around the driver. It was easy to reach everything and the 6-speed manual gearshift is ideally positioned for your right hand. The second thing was the heads-up display that provides a lot of efficiency benefits for the driver. It’s rare to find this feature in this price range. The power from the 2.5-liter engine kicks in at lower rpms and with the manual shifter, it’s easy to keep them in the right range. An automatic option is also available for those who don’t want to do their own rowing. But for driving enthusiasts, the 6-speed gearbox is a treat. It sticks neatly and precisely between gears, and the clutch pedal is easy and clean. 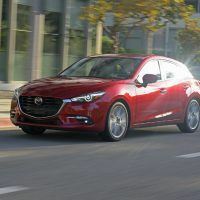 The ride on the open road can be a bit harsh with the 18-inch wheels, but overall the Mazda3 has a comfortable ride. We already mentioned the seats, but we think they are a high point for driving long distances. The compact car is tuned more for sport which is ideal in urban commutes where you want a suspension that’s sporty for maneuvering in traffic. 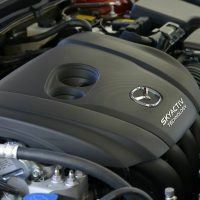 We found the 2.5-liter offers up good power in all driving situations, and the small sedan handled steep hills without issue. The new G-Vectoring Control, designed to improve handling, was definitely evident as we powered the Mazda3 though tight mountain curves. We experienced very little body lean and not a lot of understeer with the front-wheel drive car. We did get into some snow, and the traction was good even with the bad weather. 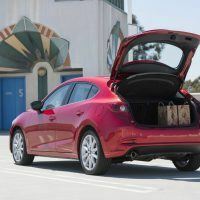 The 2017 Mazda3 offers a lot for the money and we would say it’s a good value. It gets solid fuel mileage and the driving characteristics make this small, compact car high on the fun-to-drive meter. The interior is comfortable and comes with features galore. 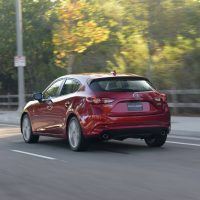 1 Comment on "2017 Mazda3 Grand Touring Review"
Another great review Denis. Mazda 3 may not be big in the US but it is huge here in Thailand and the rest of Asia.